What great luck! 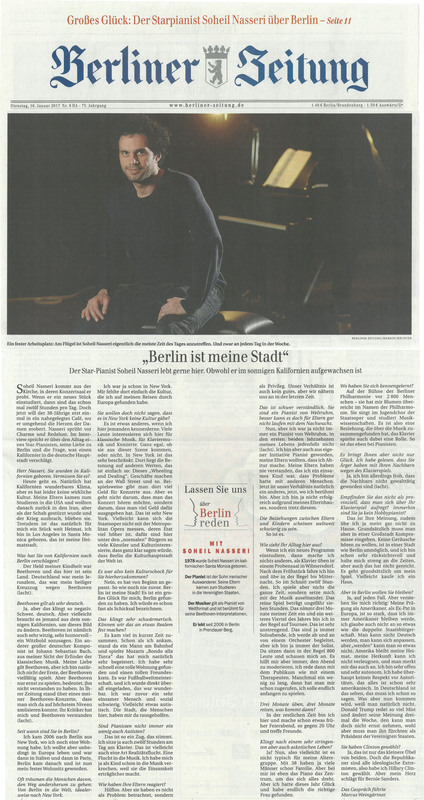 Piano Star Soheil Nasseri talks about Berlin. The piano star Soheil Nasseri is very happy living here even though he grew up in sunny California. Photo caption: A regular place to work: One can usually find Soheil Nasseri at the piano, every day of the week. The pianist is the son of Iranian immigrants. His parents came to the USA to study. The musician has international stature and is famous for his Beethoven interpretations. Since 2006 he has lived in Berlin. Soheil Nasseri exits the church where he practices daily in their concert hall. When he is learning a new piece then he is here 12 hours a day. But right now the 38-year-old wants to go to a nearby coffee-shop where he immediately conquers the hearts of the women around him. Soheil Nasseri sparkles with charm and volubility. In the interview he talks about the daily routine of a piano star, his love of Berlin and the reasons why a Californian would move to the German capital. Mr. Nasseri, you were born in California. Do you miss it? Sometimes I do, but I can manage. Of course the weather in California is wonderful but they don’t have much in the way of culture. My parents came to the USA to study and planned to return to Iran afterwards but when the Shah was overthrown and war broke out, they stayed. But California is indeed my homeland. I was born in Los Angeles in Santa Monica – that is my native city. What drew you from California to Berlin? Beethoven is supposedly very German. I came to Berlin in 2006 from New York, where I still have an apartment. I really wanted to live in Europe and was first in Italy then Paris. Berlin came after and has become my primary residence. People often dream of going in the other direction: from Berlin into the world, ideally to New York. I was already in New York. It doesn’t have the kind of culture that I found travelling through Europe. You can’t mean that New York has no culture? It is different when I meet someone here. Many people here are interested in classical music, in piano music and concerts. It doesn’t matter if they are a part of the scene or not. In New York this is extremely limited. There the emphasis is on other values- the “wheeling and dealing”, doing business on Wall Street, etc. For example you might spend a lot of money on a concert in New York. But it’s not that you wanted to really hear the concert, it’s that you spent a lot on the ticket. That’s very New York. Maybe the Staatsoper can’t compete with the Metropolitan Opera, whose budget is much higher. But here amongst the ‘normal’ residents there are so many artists and art-lovers, that I contend strongly that Berlin is the cultural capital city of the world. So it wasn’t a culture shock to come here? No, it was the right fit from the beginning, like I never had before. Berlin is my city! It was such great luck for me, to have found Berlin. I would almost describe it as fate. That sounds exaggeratingly enthusiastic. Can you relate it to something more concrete? A lot came together in a short amount of time. When I arrived here the very first time there was a man standing in the train station playing Mozart’s “Rondo alla Turca”, which thrilled me. I quickly found a great apartment and group of friends. It was the World Cup and I was constantly invited to watch the games- that was wonderful. I have been a lonely person in the past and socially difficult. Perhaps somewhat autistic. The city, the people here, they helped me out. Aren’t pianists always somewhat autistic? It seems to be a trait, that’s true. I am sitting at the piano for 12 hours a day. Perhaps that is even a kind of escape from reality. An escape into the music. Already as a child I would hide in the music because that made the loneliness more tolerable. Clueless. And they did not see any of this as a problem but as a privilege. We don’t have a good relationship, but lately we’ve been getting closer. That is difficult to understand. You are an internationally respected pianist. It couldn’t get any better for parents. Yeah, well I wasn’t always an internationally respected pianist. Certainly not for the first two decades of my life (laughs). It was also my own initiative to become a pianist – my parents wanted me to stay in school. My parents never understood that I was a lonely child and that I had problems with other people. Now our relationship is different, now that I am famous. I am not successful because of my parents, I am successful despite my parents. The relationship between parents and their children seems difficult the world over. What does your daily routine look like here? When I am learning a new program, then I don’t do anything other than practice piano in my practice space in Wilmersdorf. After breakfast I head there and stay until midnight. On average 12 hours a day. But I don’t play the whole time, I think about the music. Purely playing time is about seven hours. I do that about three months a year and another quarter year I am usually on tour. That is strenuous. Usually solo recitals, but occasionally I am accompanied by an orchestra. With those concerts there might be about 800 people in the audience staring at me. It seems helpful when I introduce the pieces and talk to the audience, then I talk to them like to a therapist. Sometimes I talk a bit too long – I have had people yell out that I should finally start playing. Three months practice, three months traveling, then what? The rest of the time I am here and practice only until 8 PM or so and then meet up with friends. Sounds like a very rigorous and even ascetic life. Is it? Maybe it is not typical for my age group. At 38, a lot of men already have families. But in my case the piano is the center around which everything else revolves. But this year I got lucky and finally found the right girl. Onstage at the Berlin Philharmonic Hall in front of 2800 people – it was her job to bring me flowers for the orchestra. She sings in the Staatsoper youth choir and studies musicology. So it is a relationship that came to be through music and the piano played a role, too. That’s the way it is with pianists. Piano doesn’t only bring you happiness, though. I read that your neighbors have been making trouble for you because of your playing at home. Wouldn’t you say that it is provincial to get upset about your piano playing? After all, you are hardly an amateur. That is your opinion. But more relevant is that I rarely practice at home. Fundamentally you have to be willing to make compromises in a city. To not want to hear any noises in a city like Berlin is just not reasonable. I am actually very considerate of my neighbors and offer to coordinate times, but that was not enough for them. They just won’t accept me playing piano at all. Maybe I will buy a house. But you want to stay in Berlin? Most definitely. But you have to understand, my upbringing as an American, as an Expat in Europe, is so significant, that I will always be an American. I do not believe in dual citizenship. You can’t become German, you can only try to fit in. America is always my home, I cannot deny my heritage, and it is very noticable in my case. I am very open and very independent. I have absolutely no respect for authority. This is all very American. You don’t see that much in Germany, I have to say. What we can expect now, of course, we don’t know. Donald Trump talks so much crap and changes his mind three times a week – you can’t take him seriously, but we ought to fear him as the President of the United States. Yes, the lesser of two evils. Republicans are all ideological extremists, so I voted for Clinton. But I was actually excited about Bernie Sanders.